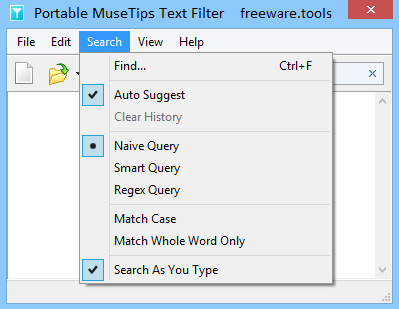 MuseTips Text Filter is a free, lightweight and portable Windows software that lets you read, search and filter text files with ease. Text lines are instantly filtered as you type your search phrase, with all matched terms highlighted in a contrasting color. While typing into the search box, the program lists searched phrases for you to choose from. This makes text search easier and faster. You can do regex searching by checking Regex Query in Search menu. For large text files, regex query may be noticeably slow. In this case, you can uncheck the Search As You Type option in Search menu. Given this is a portable tool, no installation is required to use it, hence no changes are made to your PC. Portable MuseTips Text Filter is a simple-to-use program with limited features which allows you to quickly locate text within a document, packed in an framework that can be handled even by less experienced users. Since Portable MuseTips Text Filter does not come with an installation package, you can store the app on a USB flash drive or any other removable device, save it to any computer and directly run its executable file. Therefore, you can carry Portable MuseTips Text Filter with you whenever you're on the move. What's more important is the fact that the Windows Registry is not updated with new entries, and no leftover files can be found on the hard drive after program removal. The interface of the application is based on a plain and intuitive window where you can import a text document (e.g. TXT, RTF) by using the file browser or 'drag and drop' functionality. Alternatively, you can paste text directly in the main application window. So, Portable MuseTips Text Filter's main attraction is that you can use a search function to locate text while writing it. Therefore, each found entry is highlighted in yellow. Furthermore, you can access recently used files, enable word wrapping mode, make the app hide matched or unmatched files, disable the toolbar and status bar, toggle the auto-suggest search feature, as well as pick an option between 'Naive', 'Smart' and 'Regex' query. The straightforward software application runs on a very low amount of CPU and system memory, has a good response time, supports keyboard shortcuts, and includes user documentation. No error dialogs are displayed and Portable MuseTips Text Filter does not freeze or crash. Although its lack of advanced features may disappoint advanced users, rookies can quickly learn how to work with Portable MuseTips Text Filter, thanks to its intuitive layout and overall simplicity.